HDPLEX 400W AC-DC adapter is a full-digital control resonant power supply. It uses 2 Oz copper PCB and heavy duty copper lane which ensure high current transfer at super low loss. The end result is an amazing 93%+ efficiency. Two ST DM2 MOSFETs are used for HDPLEX 400W AC-DC adapter LLC stage. This high power ST MOSFET features a very low recovery charge and time and show up to 40% lower RDS. High dV/dt ruggedness (40 V/ns) allows HDPLEX 400W AC-DC performs reliably even when exposed to large voltage transients such as noise and harmonics on AC power lines. Two ST MDmesh V power MOSFETs with world's best RDS(on) area ,low gate charge, and low on-resistance, combined with state-of-the-art packaging are used for PFC Stage of HDPLEX 400W AC-DC adpater. HDPLEX 400W AC-DC adapter use PC55 magent core with full copper coil for LLC transformer,LLC inductor, and PFC inductdor. This separate transformer and resonant inductor design enable balanced thermal Load, prevent overheat, and significantly increase component life. Two Energy Storage Capacitor with massive 120μF are used. With super Low 0.1W idle power consumption, HDPLEX 400W AC-DC adapter exceeds EuP and DOE Level Vi standard. HDPLEX 400W AC-DC supports complete set of protection mechanism including OVP,OCP,OPP,SWP,UVP,OTP. The 40mm super quiet 12V DC fan is dynamically controlled by current detection circuit. HDPLEX 400W AC-DC operates in full passive fanless mode for load less than 250W. HDPLEX 400W AC-DC is an internal super high efficiency AC-DC adapter. It is designed to work with HDPLEX 400W/800W DC-ATX and Thin-ITX/NUC platform. It accepts 90-264VAC input and outputs 19VDC. Its compact size (180x58x40mm) and versatile mounting options enable powerful performance in small package. HDPLEX 400W AC-DC works with NFC S4M case out-of-the-box. HDPLEX 400W AC-DC has 12VDC JST XHP-2 connector for optional external 40mm DC fan and supports detachable mounting ears. The fan will start once the output power is higher than 250W and fan speed is controlled dynamically based on real-time load/output amperage. 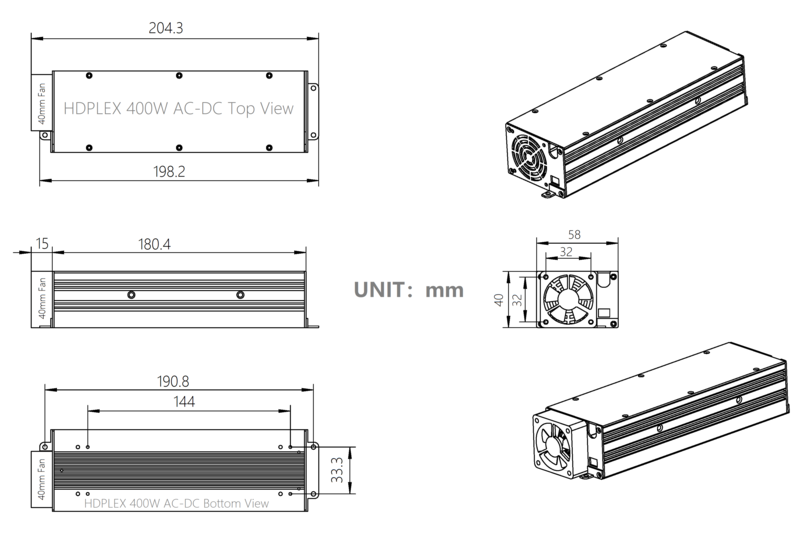 The 40mm DC fan can be mounted on either side of the 400W ACDC. We recommend to mount it on the AC input side. 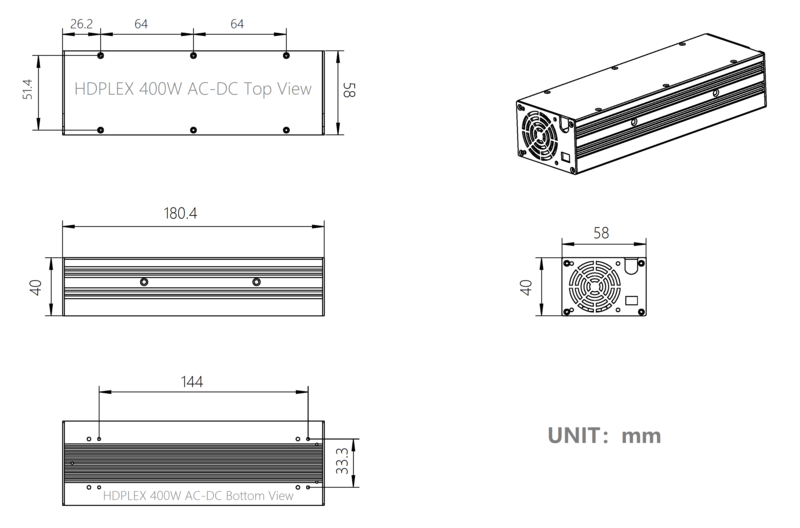 Since HDPLEX 400W AC-DC features high efficiency design with best components such as ST MOSFET, it can be run in full passive and fanless mode for application demand less than 300W power consumption. 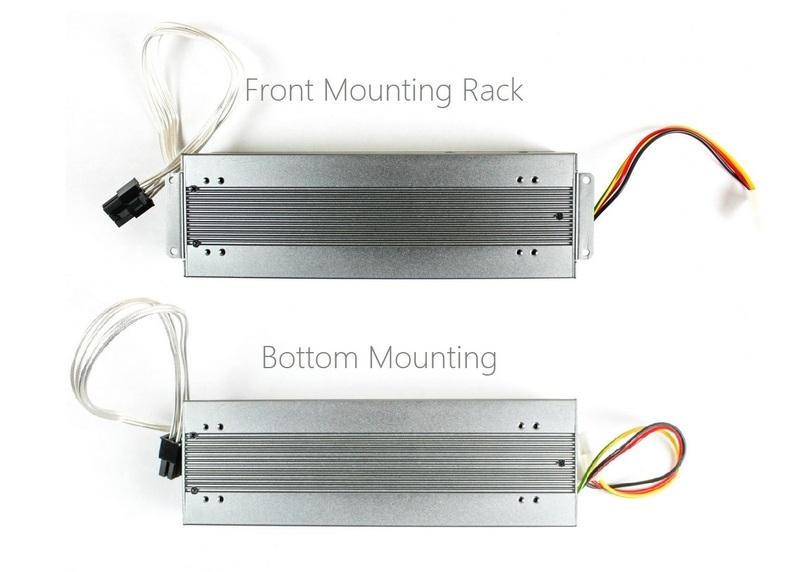 HDPLEX internal 400W AC adapter supports two mounting method and is best paired with HDPLEX 400W DC-ATX. This HDPLEX NanoATX combo could support mainstream platform such as Intel core i7 8700K+GTX1080Ti. This combo could deliver 400W power with >90% efficiency and will support 450W peak. HDPLEX internal 400W AC-DC adapter uses JST ELP-03V connector for detachable AC input. Two AC input cables are included. 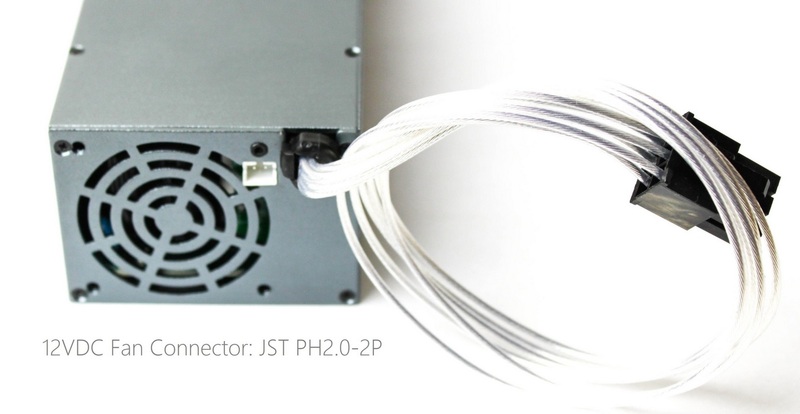 They are JST ELR-03V to C8 cable (for PC case with standard C8 cutout such as NFC S4M case) and JST ELR-03V to C14 cable for PC case with standard C14 cutout such as HDPLEX fanless PC case. HDPLEX 400W AC-DC adapter uses Molex Mega-fit 6PIN connector for detachable DC output. HDPLEX has two DC output cables. They are Mega-fit 6PIN Male to Male cable for HDPLEX 800W/400W HiFi DC-ATX connection and Mega-fit 6PIN Male-7.4*5.0mm w/PIN cable for Thin ITX/Laptop connection. HDPLEX 400W AC-DC is best to work with HDPLEX 400W HiFi DC-ATX. This powerful HDPLEX NanoATX combo power supply can drive system with hi-end video card like GTX1080Ti. HDPLEX 400W AC-DC can also power HDPLEX 800W DC-ATX in a dual setup. This HDPLEX 800W NanoATX combo can power the most demanding system like 9700k with RTX 2080Ti and SLI setup. 3D Engineering Drawing Download: IGS and STEP format. Installation Screws. 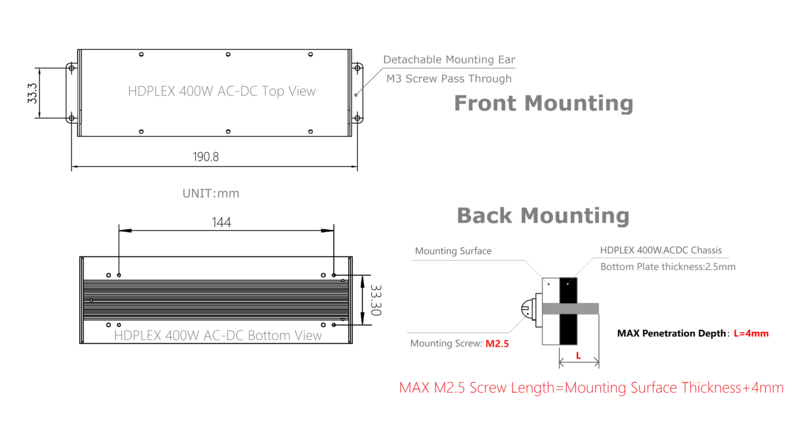 Very Important: 40mm Fan can only be installed using Rubber Screws! Metal Screws will cause electric shock!